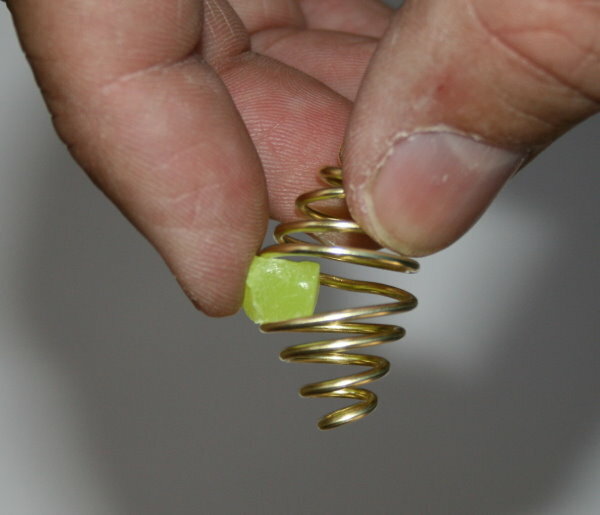 One of the things I brought to the 2008 SciFoo science conference was a couple hundred vials of kryptonite. I figured there would be at least one evil genius at the conference who would need one, and a whole lot of people who would like to have some just because it's fun. 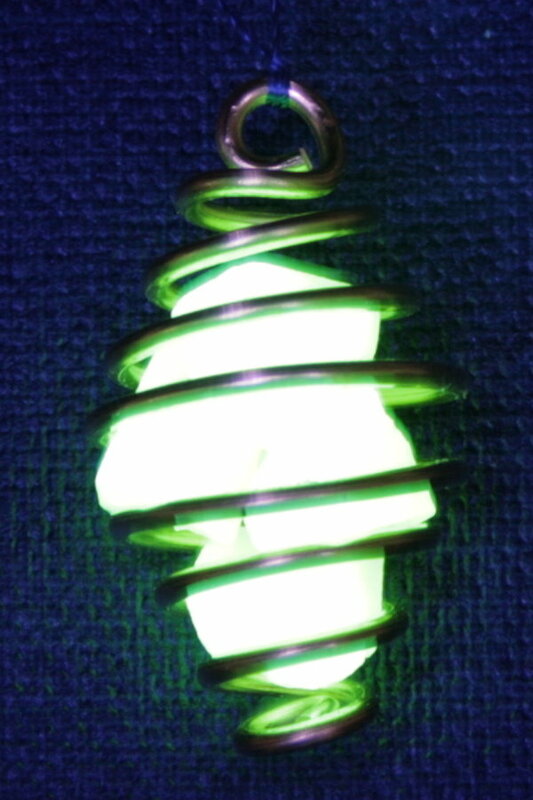 Kryptonite is the name of a new material that is 6 times better than any previous glow-in-the-dark material. Exposing it to the sun for an hour or two enables it to glow all night long — over 12 hours. 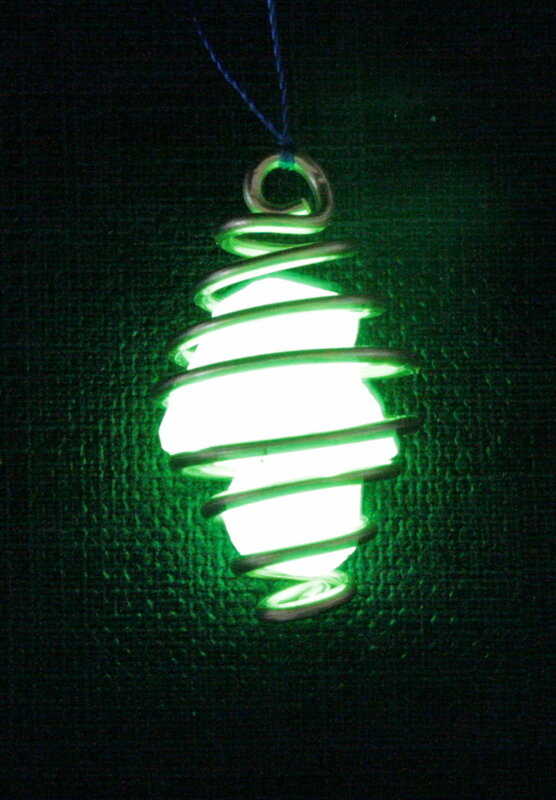 And of course it glows bright green. 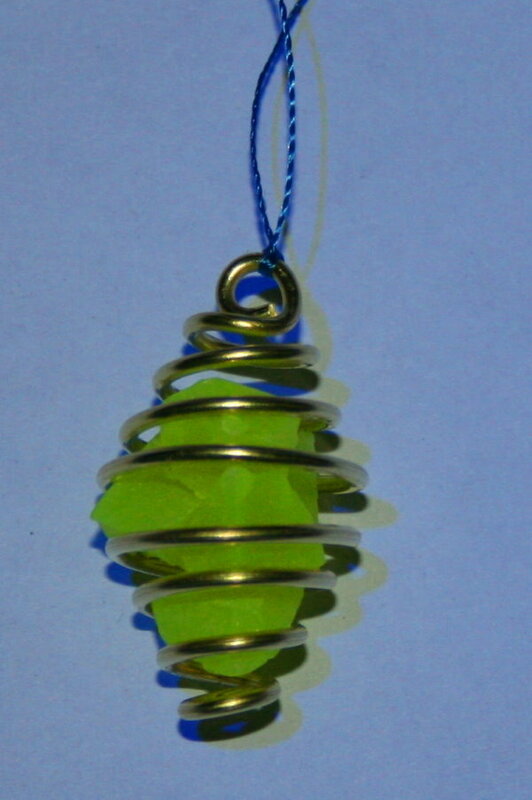 Since I was having fun, I thought it might be nice to hand out pendants filled with kryptonite. There is an easy way to make little gold spirals that can hold irregularly shaped things like these little rocks. You can use this technique for holding crystals, a nice marble, or just about anything. 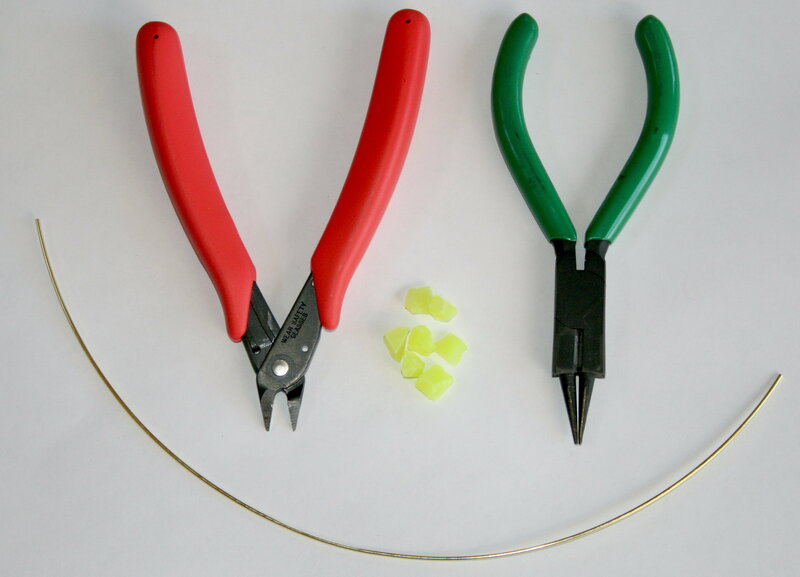 All you need to make the pendant is some brass wire (from a hardware store), some wire cutters, a pair of pliers (I used a nice pair of round-nosed pliers, but any long nosed pliers will work), and some kryptonite. 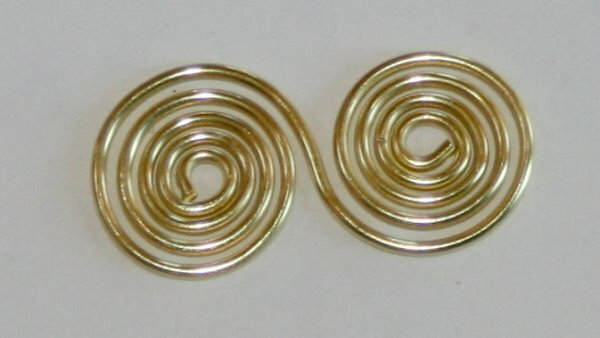 Start by cutting a ten inch length of brass wire, and bending the ends into small loops. 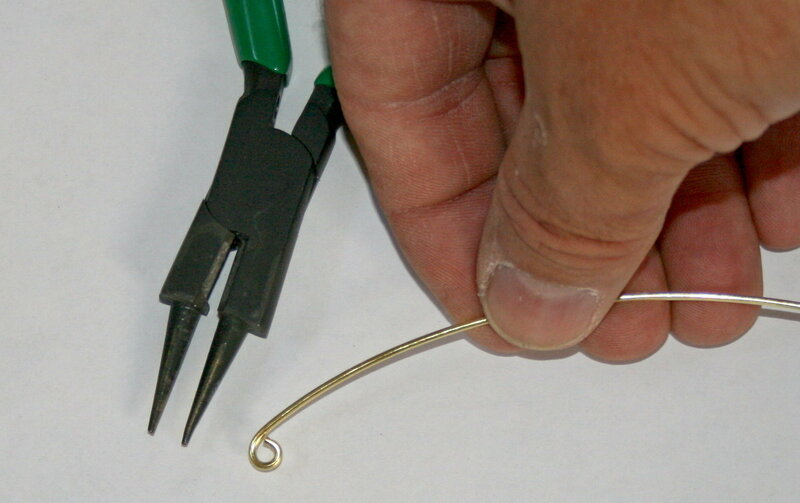 You can bend the wire around a bit of coat hanger wire or an ice pick to get a nice round loop. Bend each loop so that it is opposite the other, so the wire looks like an "S". 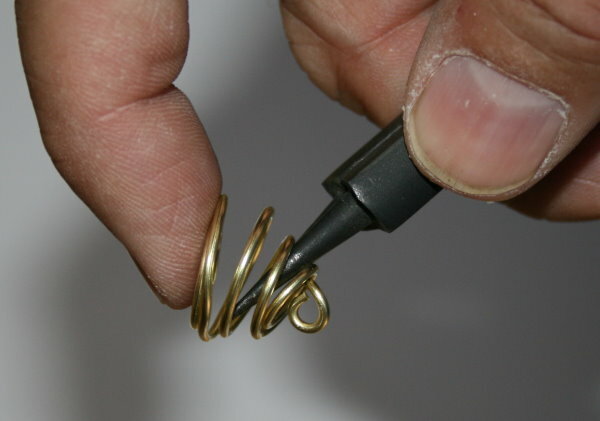 Using the pliers, continue bending the wire around each loop. You can tape some cardboard to the inside faces of the pliers so that the wire does not get dented or marked by the tool. After a couple of turns are done, the spiral is big enough to continue bending with your fingers alone (no pliers needed anymore), which ensures that the wire doesn't get damaged. When you are done, the wire will look like a fat "S". 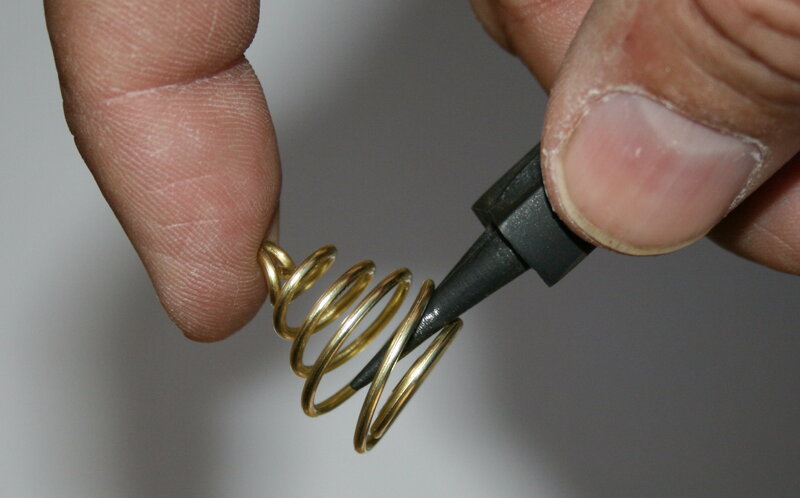 Use the pliers to bend up one of the inner loops. This is where the necklace will hang on a chain or string. 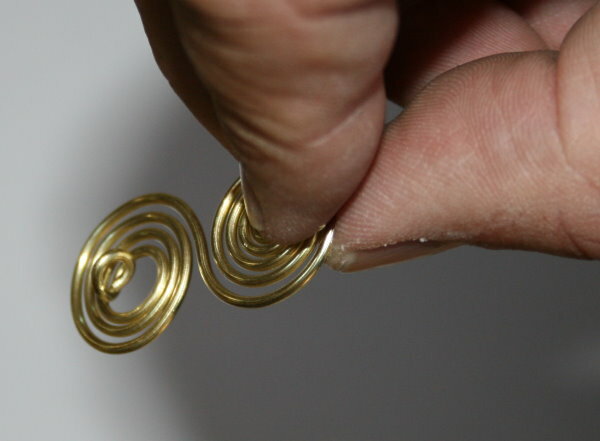 Next, fold the two spirals over onto one another. 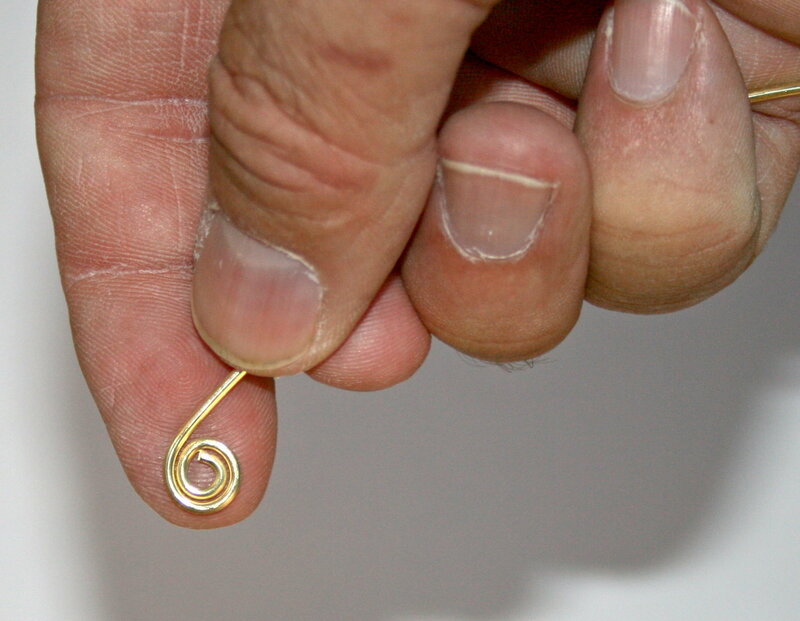 You can use the pliers to gently straighten out any kink at the fold, but after you've done a couple of these, you'll get good at not making kinks. You might be tempted to simply pull the spiral apart at this point, but I find I get better results by inserting the closed pliers (or a pencil point) between the open part of the folded spirals, and working the wire apart gently, rotating the spiral so the pliers move towards the center. You can see the spiral cage take shape. When one side is done, repeat on the other side. You end up with a nice spiral cage. Now you can insert your kryptonite. 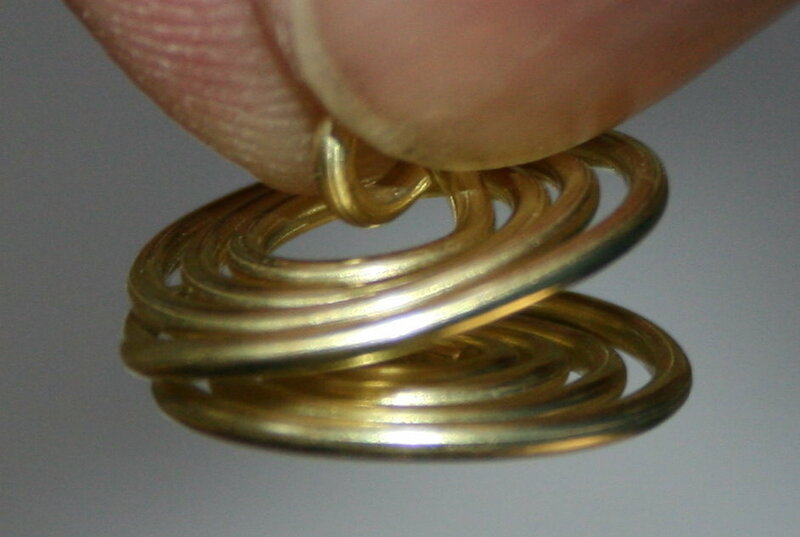 You can wedge it between the loops of the spiral cage, and they will spring back when the rock is inside. 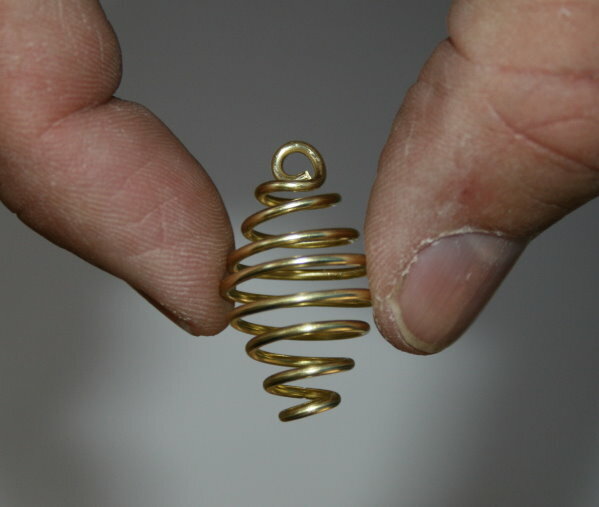 If you are using soft brass wire, you can push the loops closed if they don't spring back. If the pieces of crystal are small enough to fall out of the cage, simply glue a few of them together with some super glue to make larger pieces. I like to use brightly colored embroidery thread to hang the pendant. 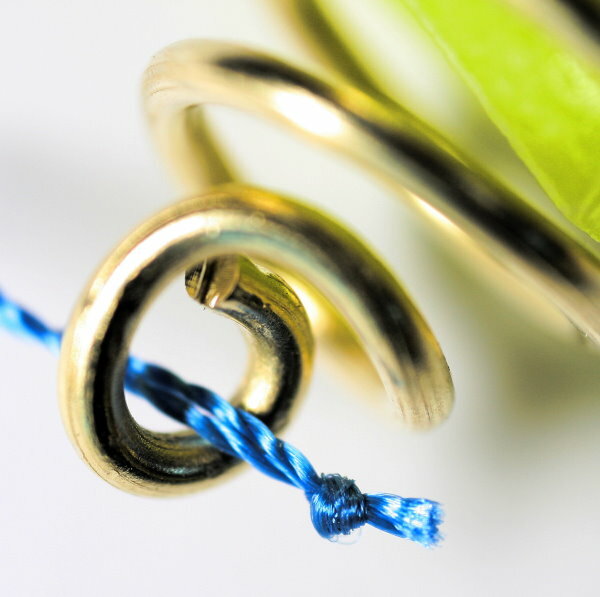 Make a loop big enough to go over your head, and tie a double overhand knot, then cut off any excess thread on the ends. Push the knot through the pendant loop, and then push it through the loop of thread on the other side of the pendant. 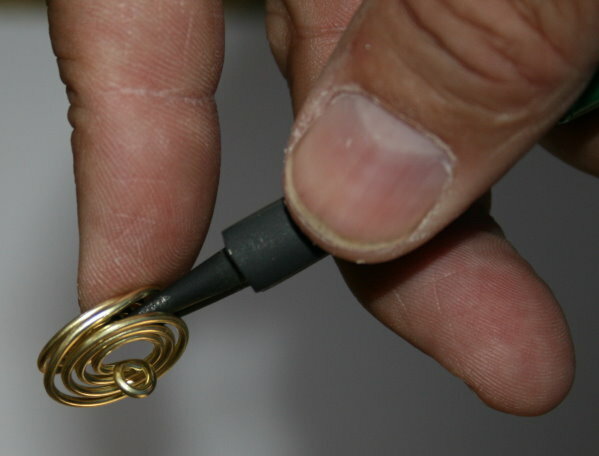 This forms a simple knot at the pendant loop that will keep the double overhand knot at the top, where it will hide behind the wearer's neck. 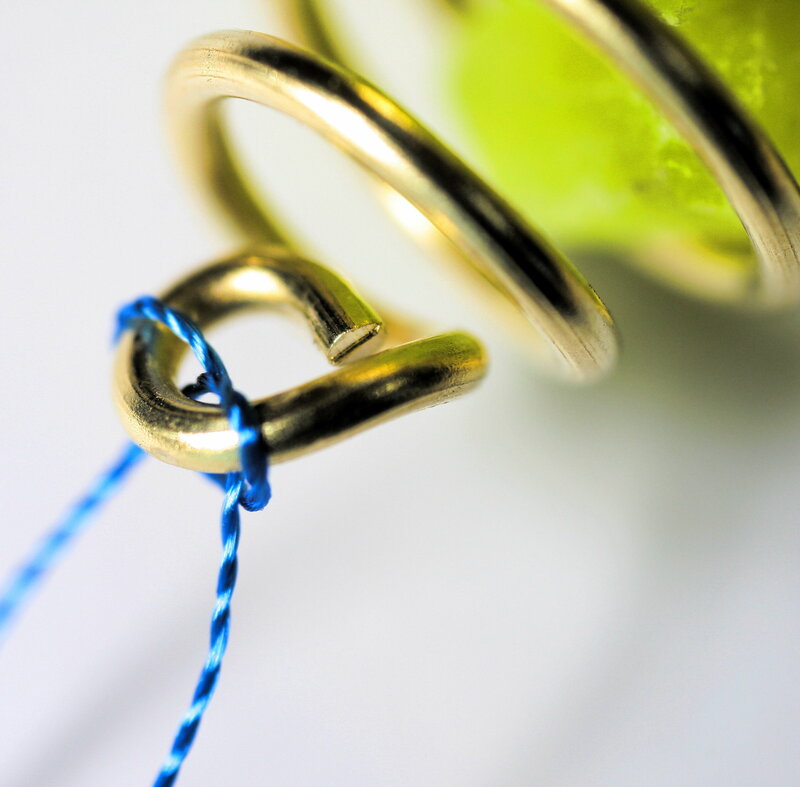 The weight of the pendant will keep the overhand knot hidden up there. In daylight, the yellow-green crystals will absorb light, and you will see only the faintest traces of glow. In the dark, however, the light is enough to read by (if you plan to actually read from it, you might want to make a bigger spiral and use more rocks, to prevent eye-strain).